Rather skip the reading and get to the point?? Two apps are needed if you want all of the newest emojis. The links will take you directly to the apps in the app store. 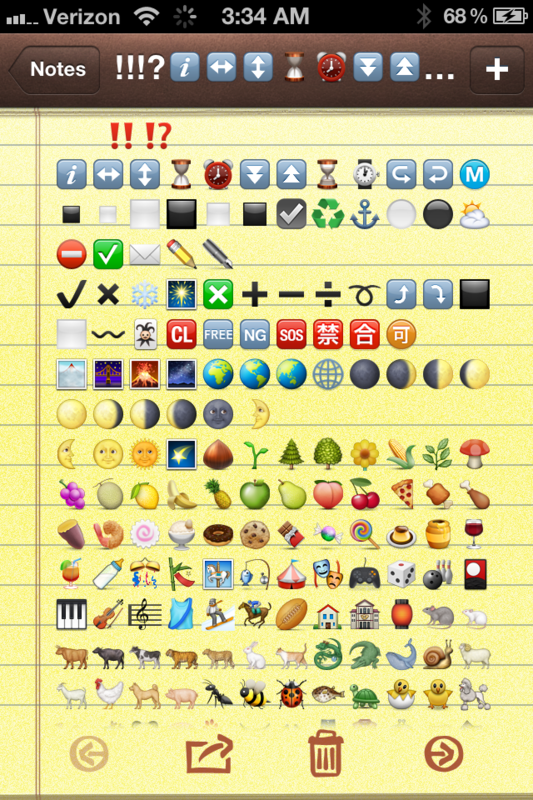 April 28 ’12: Beware new emoji apps not mentioned here that allow you to use the new emoji icons with the keyboard. The process is basically more complicated than the copy/paste method. As of now, there is still no efficient keyboard integration for the new emoji icons, and copy and paste is the way to go. Just keep them handy in a note if you want to use them regularly. -We are keeping our eyes peeled for even more new emojis to be released. It shouldn’t be long before there is an emoji for everything. We will keep the page updated with the newest emoji apps. I’m very into technology. I always have been. When something new comes out that interests me, I need to learn everything I can about it. I’ve had the iPhone for about 4 years (upgrading as I went along) and can’t see myself ever switching. I’m still obsessed with it and encourage all of my friends to get them as well, so that we can enjoy the benefits offered only to mutual iPhone users (apps/games, facetime, etc.). One thing I love about the Apple iPhone (and all Apple products..Macs/iPads/iPods) is the emoji feature that allows people to share little emoticons with other iphone uses, in text, emails etc. 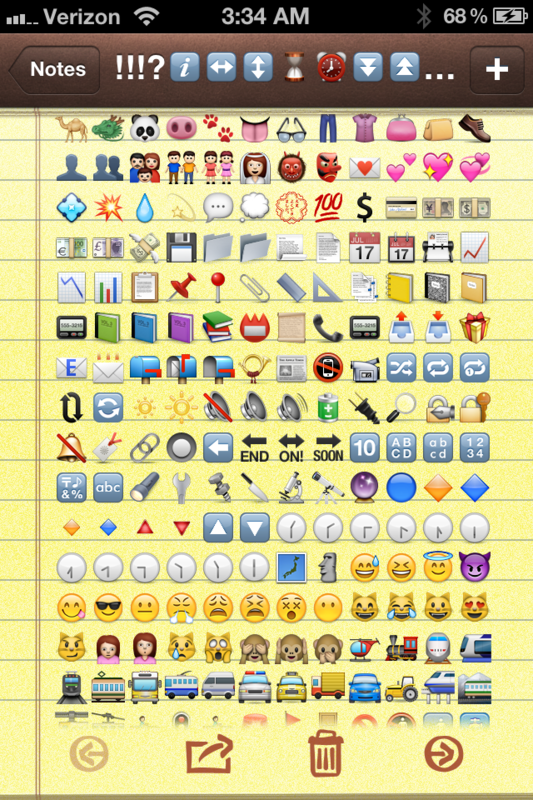 For as long as the iPhone has been around, there has been the same standard set of emojis. Occasionally, I check to see if anything has been updated and more have been added. Needless to say, this has never been the case. Until recently. While looking around some social sites, I noticed people posting screen captures and comments which consisted of a ton of new emojis. I saw other people asking how they got them, etc, but it seemed to be some big emoji secret that Apple geeks were keeping. Since you asked, my opinion is that the secret keeping was pointless and counterproductive. I want people to send me new emojis in their texts so that it’s easier for me to pretend I’m interested in the conversation. They’re little pictures, people. Not some hidden oil field. Funny enough, the process of getting the new emoji icons is extremely simple and not a secret at all. So, for anyone cruising through the site (and I’m sure plenty of you have iPhones), I’ll take you on the quick and easy journey to getting the 2012 emoji “update”. What is pictured on the page is all of the new emoji icons you will receive from the two apps that are mentioned. If you’re visiting us on a mobile device, see the bottom of the page for a few of the emojis in action (for the skeptics). Just to make things unnecessarily complicated, but more efficient for those who are unfamiliar with the whole “app” process, I’ve created two videos to quickly explain the process of obtaining the new emojis that people are flaunting in their instagram, texts, twitter, etc. The new emojis come in apps that must be *purchased* in the app store. Your phone/iPad/iPod Touch does not need to be jailbroken. How did they do it? They were able to do it, because the apps don’t integrate a new keyboard. To use these cute pictures, you’ll have to look through what you want to use, either in the app itself, or from a note you paste it into. You’re not going to be able to access these new guys as easily as you will the ones that have been around forever. There is NO application that can enable a new keyboard. Apple doesn’t allow it. This is the best that outside developers can do. App 1: Get this app if you want the full spectrum of new colored emojis (no black and whites). The price is $1.99 in the app store. will send you directly to the above mentioned app, within the app store. App 2: UPDATE- The app mentioned below is no longer available. The link provided is for an emoji app containing all black and white symbols that are not available through regular emoji! This app includes some of the new colored emojis and lots of black and whites emojis. Price is $0.99. Pretty easy and probably not as exciting as some had hoped, since there isn’t a new keyboard accesible from within texts and other apps that are emoji compatible. I suppose this is the best they could do for now. I’m sure there are several other apps with more emoji icons, and this will continue to be the case, as developers have realized they can create their own and make some big money off of it from the app store. Now the silly little kids on the internet will have to find another secret. 😉 Just hope I don’t have the emoji mob knocking down my door later. Fibro friends, this is just one more thing for you to enjoy and have fun with! 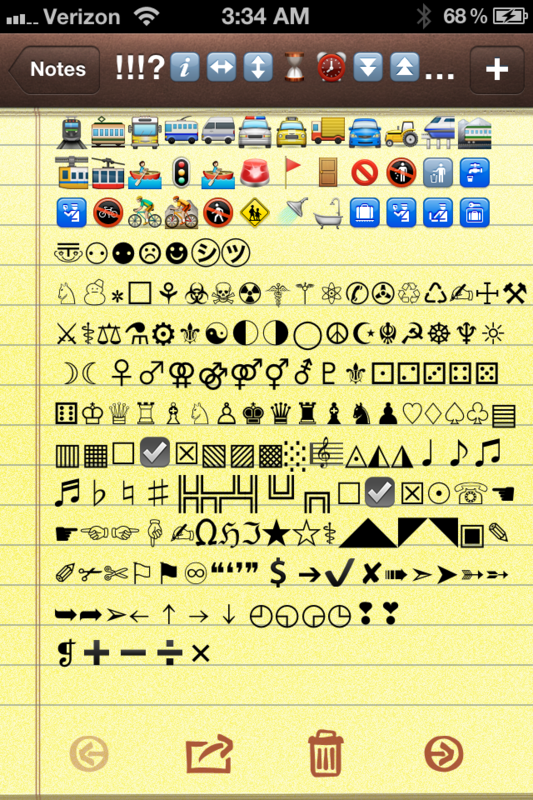 For those of you visiting from your iDevice and who have bothered to read down this far, here a a few of the new emojis in action, so you are able to see that they actually work (try copying and pasting into a note or text). I’m not going to put all on here, because I don’t want to take potential income from the people who put in the time to create the apps. It’s stealing, in a way, and everyone deserves to make a living if they actually try. These icons will not be visible to visitors viewing on a computer. You’ll see a few black and white pictures, as well as boxes. The People who didn’t have emoiji “2012” can see them? If any of you guys know how to get the black and white hear no evil, speak no evil, and see no evil symbols please tell me! !